Based on your feedback we’ve updated the documentation site template and added a new responsive layout which means you can now read the documentation on your mobile and tablet. We’ve also introduced a much needed Search facility that lets you search the entire Zynk Workflow documentation site. If you spot anything we’ve missed please send an email to support@zynk.com with the URL and details of the change, or just edit the page on Github and make a pull request. Zynk is a business automation and integration platform that can be configured to automate virtually any business process, either manually when required or set on a trigger based schedule. Zynk ships with a wide range of connectors covering everything from accounting products, CRM systems and Ecommerce platforms to various storage providers and data conversion tasks. Each connector provides a number of tasks that can be used to import, export and transform data as required. Zynk can send out marketing or other messages via SMS Text Message to customers or prospects informing them of special offers or for delivery of goods when despatch notes are created. Zynk can accept incoming emails from an email address (requires POP3 access) and store attachments, add the email to a database and even send an auto-responder back to the person making the enquiry allowing you to automate any inbound emails. HTML - using the Razor engine HTML documents can be created from any data source, for example publishing your top 10 selling products to your website. PDF - Generate PDF files from Text, HTML, XML, Excel and Word. 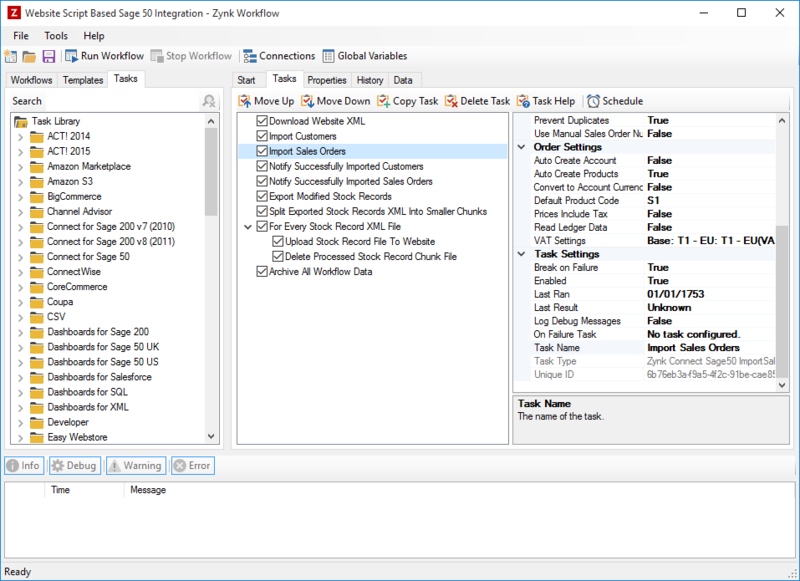 Once a workflow is created it can be run on demand when needed or scheduled to run on a regular basis using Windows scheduler. Zynk can be configured to check stock levels and report on any inventory items falling below re-order level and send an update via Email or SMS. Zynk could go one step futher and generate an email or purchase order in your accounting system to your supplier to re-order the items that are below re-order level. Zynk can extract information from many different data sources around your business to create a business dashboard which is then available to anyone in your organisation. Zynk can be configured to extract information from your database, accounting or CRM system and send that information to you on a regular basis by email or even by publishing the information to an public website or private intranet.